A little while ago I managed to pick up a couple of lovely little bits of puzzling treasure..
First on the list was a particularly gorgeous creation from the mind of Oskar and the workshop of Tom Lensch. I’ve been trying to get hold of a copy of Wanderer for a while now and on the odd occasion when I spotted one in the wild, I didn’t have enough cash left in my wallet… this time I saw it coming and made sure I was suitably liquid and managed to snag myself a copy. The concept is simple, a shuttle is captured inside a cubic cage with a number of strategically placed notches in the walls allowing the shuttle limited movement due to a couple of pairs of protruding bumps on its sides. The shape of the shuttle itself allows some interesting movements between both opposite and adjoining sides of the cube, but only in some directions … and then only when the notches / bumps allow. 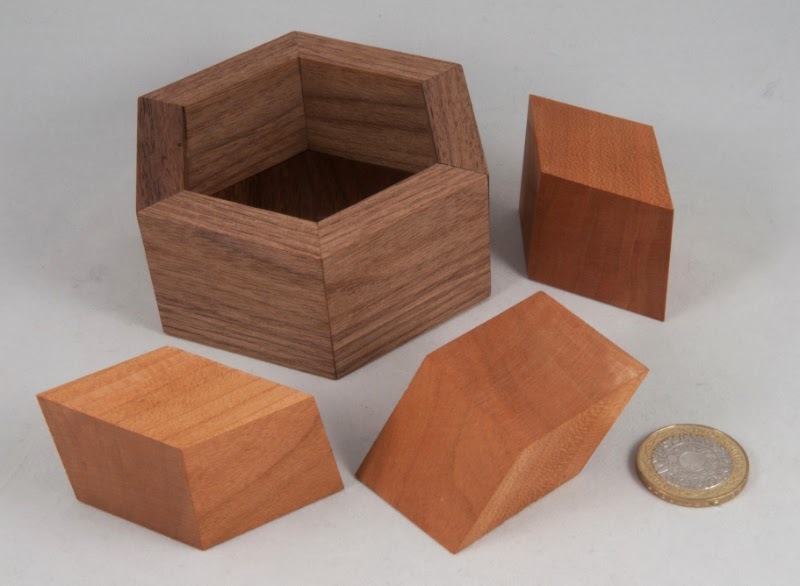 If that all sounds rather familiar, it probably is since the Hanayama Cast Cuby is a scaled down shinier version that simplifies the construction a little… although I suspect that the simplification hasn’t done anything to reduce the solution-depth. I just love the look of the thing – way the shades of the different woods on the shuttle play out across its rounded underbelly is just brilliant. The beautifully precise work on the corners of the frame is tremendous. Definitely a little treasure to add to the collection. 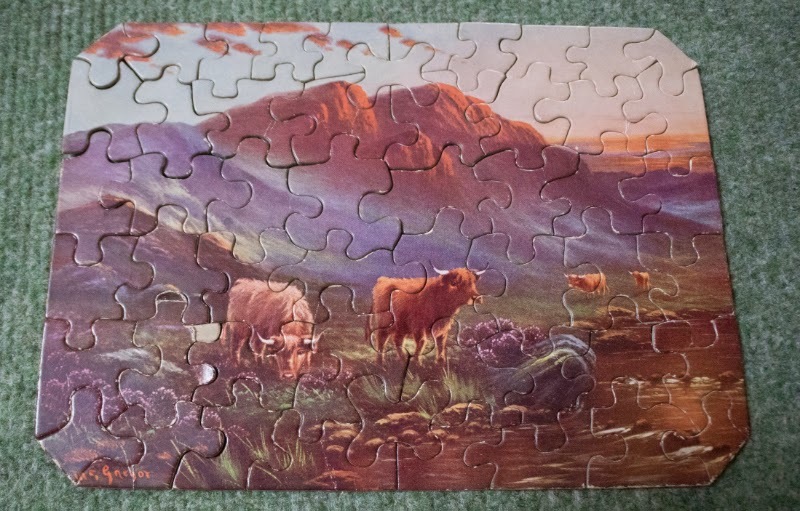 Next up was a variation on another puzzle on the collection already. 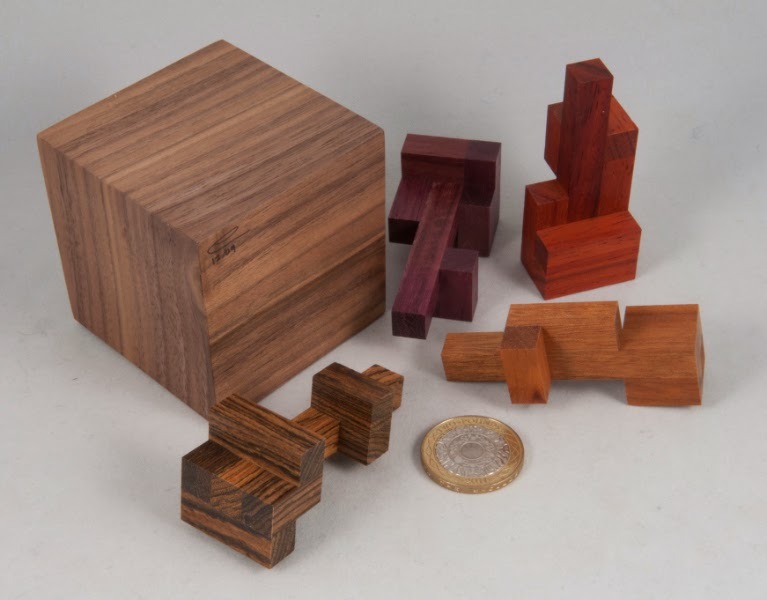 Three-Piece Blockhead was Bill Cutler's gorgeous IPP15 exchange puzzle. 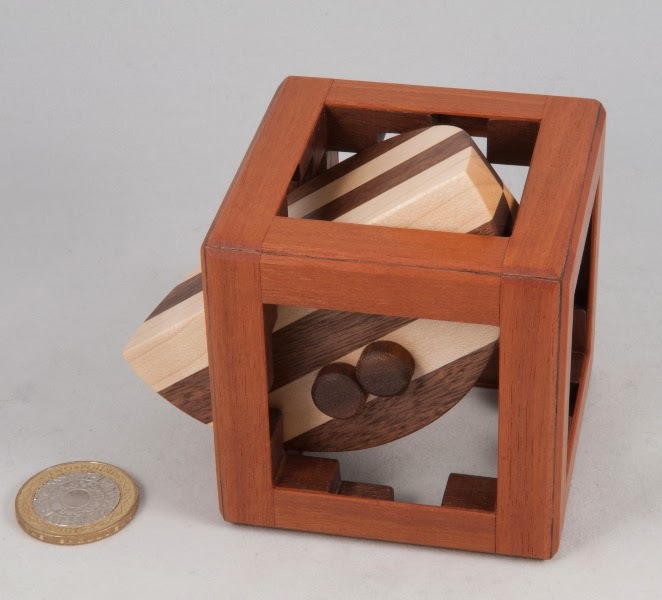 As the name suggests, it’s a variant of the famous Blockhead puzzle that only uses three pieces. 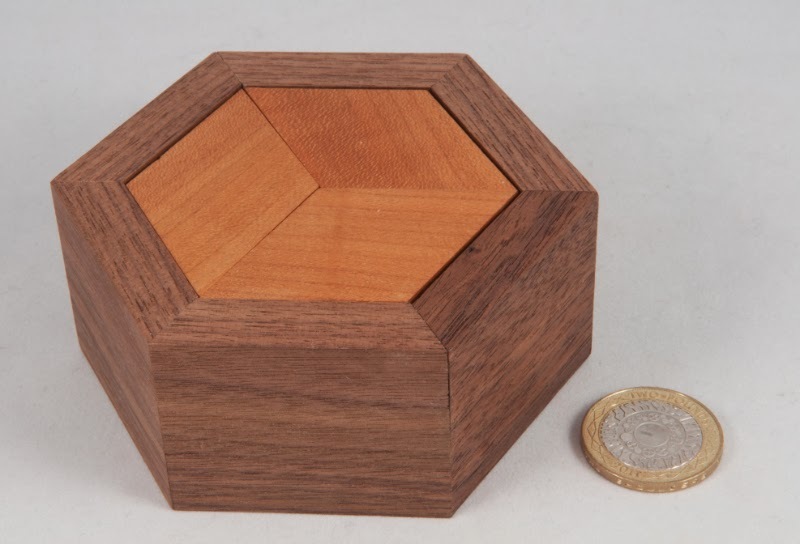 Instead of four blocks in a square frame (honest guv’) this one asks you to simply place three cherry blocks into a hexagonal walnut frame. Everything looks neat and tidy when the three blocks are in the frame to start with, but tip them out and it’s rather obvious that there was a little subterfuge just below the surface of that little puzzle as the blocks aren’t really shaped the way you might expect, so finding the right way to put them back into the frame is a non-trivial task. 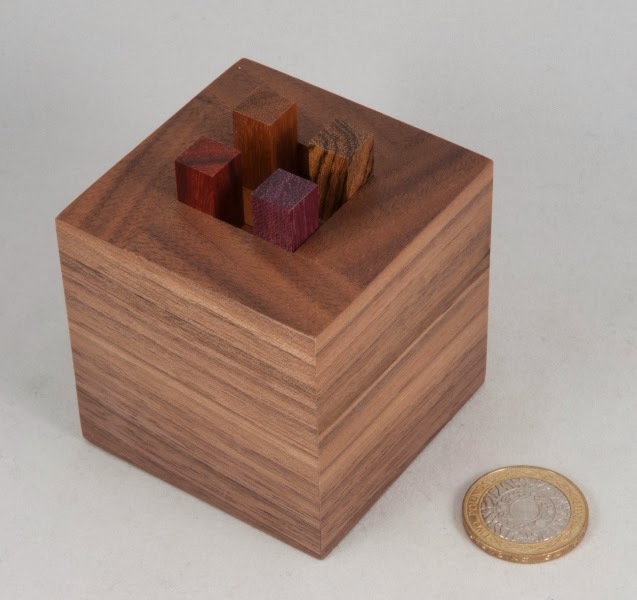 Lastly a lovely little Eric Fuller creation that has been on my lust-list for ages… it was one of those things that jumped out at me from Eric’s gallery pages as being simply stunning – Alfons Eyckmans’ Lolly Box. Four colourful wooden Lollies are packed in a walnut box so that only their sticks protrude. 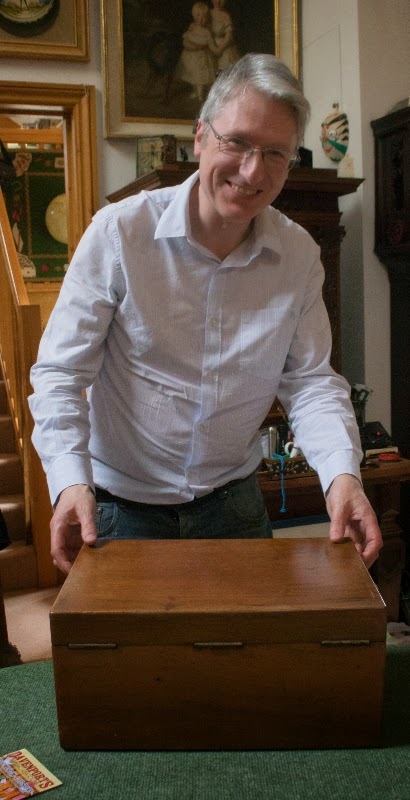 It’s been beautifully made by Eric so the pieces need to be aligned rather neatly to enable the necessary moves… and those internal protrusions are in just the right / wrong place – depending on your point of view. 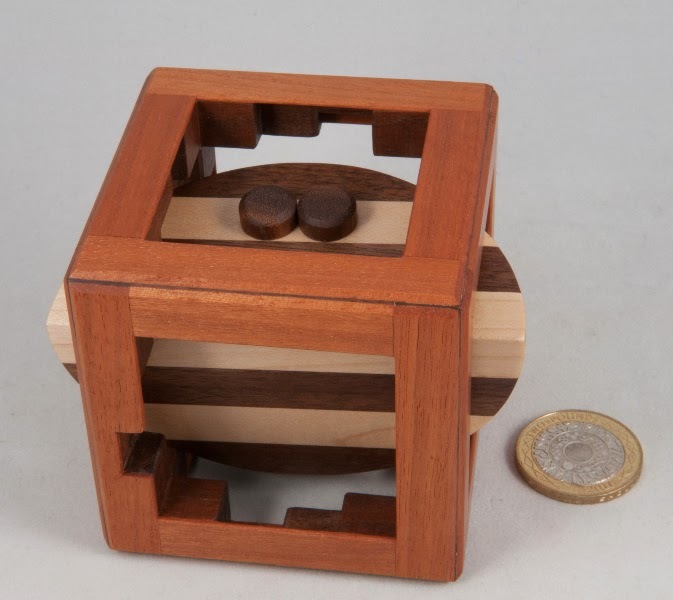 A stunning little puzzle that I’m glad has now moved off the lust-list and into the little collection. 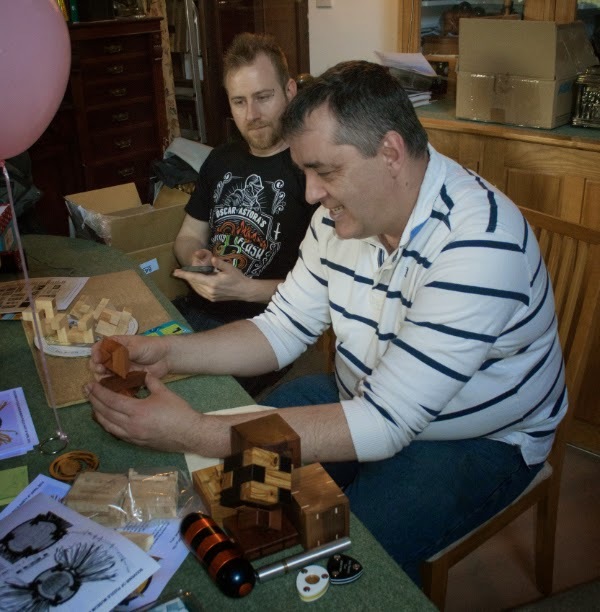 James Dalgety has a bit of a tradition of hosting a puzzle gathering over the Easter weekend each year, so on Easter Saturday I found myself heading down the M5 to deepest darkest Devon for a day of puzzling and banter with puzzling mates. The roads were rather quiet so I found myself driving the last few miles at a rather sedate pace so that I wouldn’t arrive before the official start. As it was, I was one of the first to arrive so I took out some new toys for everyone to play with and settled down to a cup of coffee and a quick catch up with James. 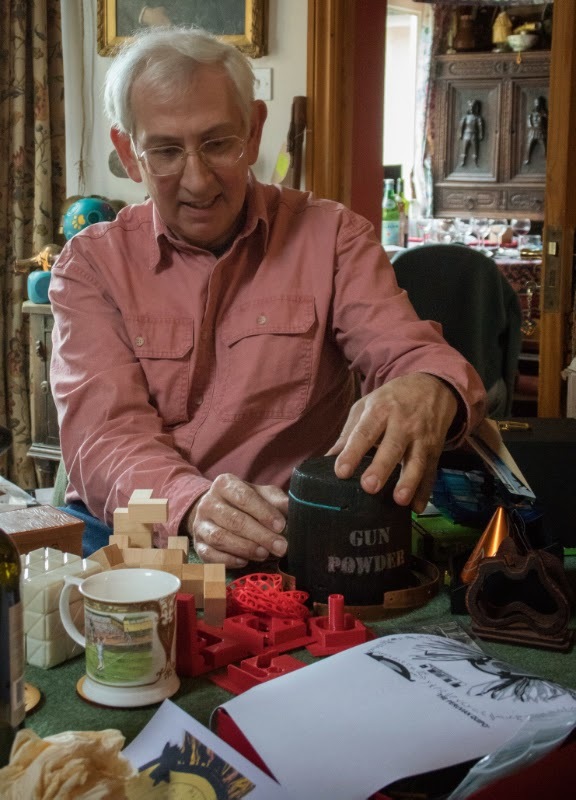 Steve (M) had brought along a puzzle specially designed for the day – James’ invitation had suggested bringing things along that were puzzling, or flew or would blow up… so Steve brought us a sequential discovery puzzle resembling a small keg of gunpowder that he’d knocked up especially for the day. A couple of us had a squizz at it and quickly found a few bits that we could remove… so we removed some rivets and a brass strap discovering a little hex key along the way. The hex key enabled us to remove a screw in the top of the barrel, which in turn helped us to liberate an aluminium rod with a few matches in it... do you know where this is going yet? At one point James noticed I didn’t have a puzzle in my paws and dived into one of his drawers of treasure and produced a little puzzle from Lee Krasnow called Sequential Star – ignoring the name at first, my initial thoughts were that this was simply a standard diagonal burr made to Lee’s somewhat exacting standards… except it didn’t quite start coming apart as I had expected it should, and when I did manage to get some movement on one of the piece I spotted a routed track in one of the pieces… this thing’s different! 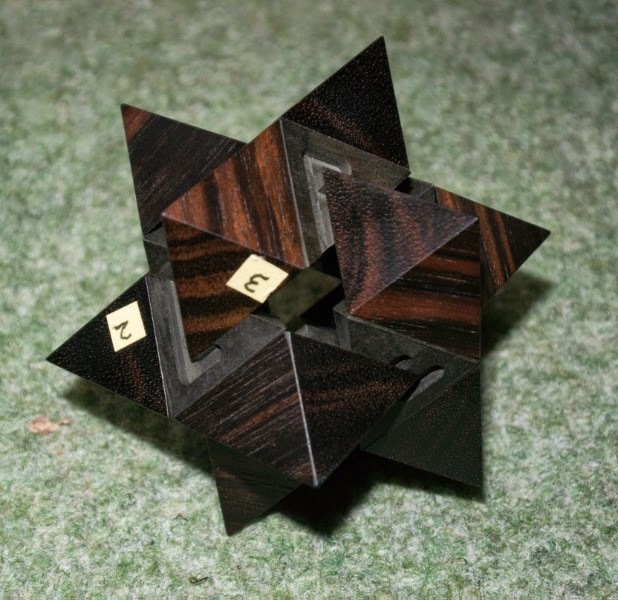 I then spent absolute ages playing with the binary mechanism and taking it almost apart and then putting it back together again… an absolute joy to play with – and a pretty rare treat given I think there were only ten copies made. 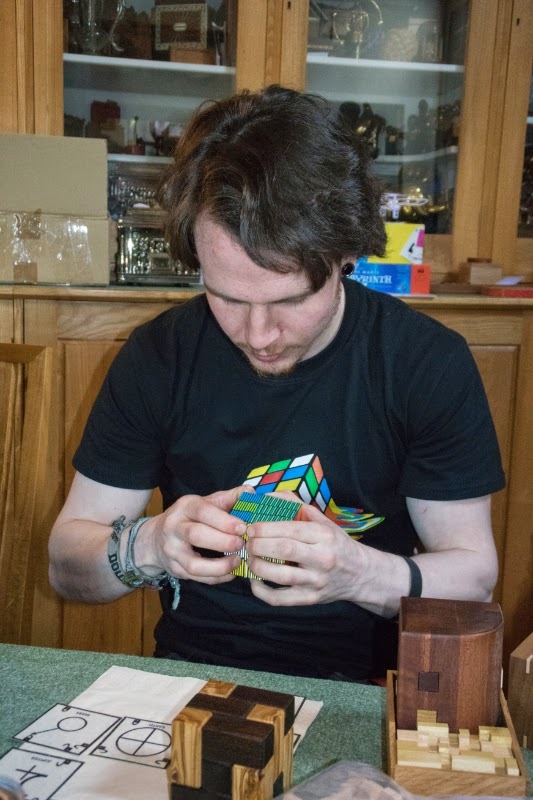 Lindsey provided a wonderful lunch yet again – providing a brief period of silence in the Dalgety house while the assembled puzzlers refuelled. 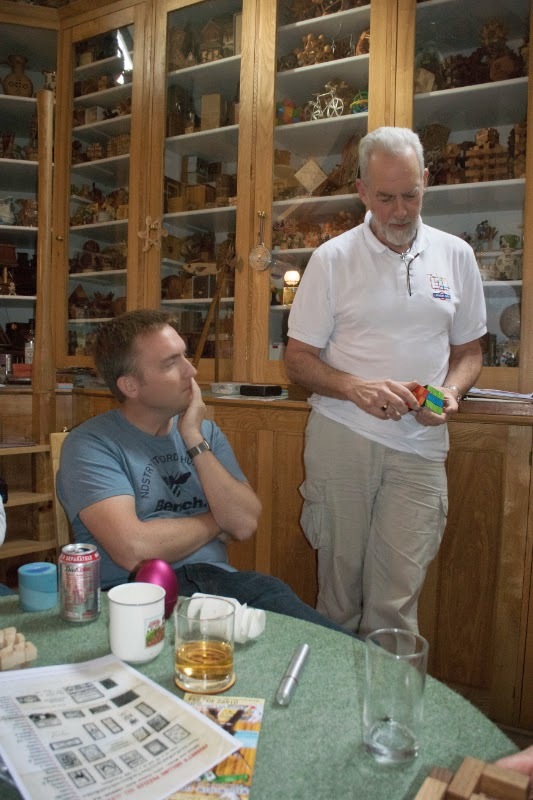 The afternoon saw a Berrocal race of sorts with Adin and Stephen disassembling a statue each, mixing up the bits and then having to reassemble the other’s statue… it’s one way to give them a bit of a polish. 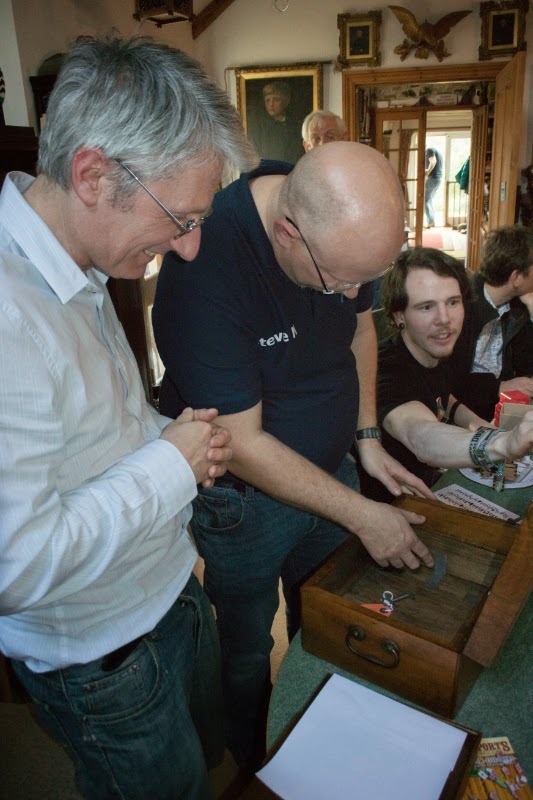 At one point Gerard was given an old stationery box of sorts to play with… as usual, all was not what it seemed and pretty soon he and Steve (M) were pushing and prodding and finding all manner of hidden compartments secreted around the rather unassuming-looking box. Several people had brought along their spare puzzles for others to barter or buy and I ended up picking up a few copies of Kevin Holmes’ puzzles from Frank and a number of books from James’ shelves of duplicates – including a number of first editions of a few old puzzle texts that I’d only had in rather tatty paperback copies until then. 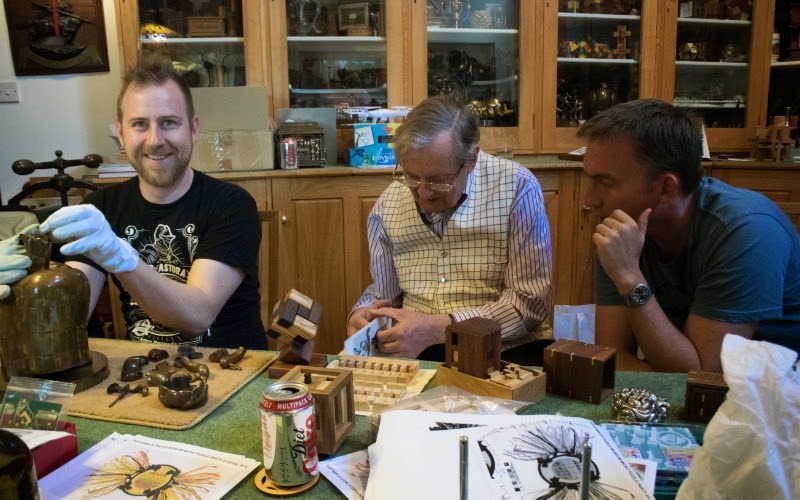 When I headed back up the road at about 7:30 there was still a large contingent of puzzlers furiously puzzling – from some of the stories of folks stopping for a kip on the way home, I suspect that some left considerably later than I did… another fantastic day’s puzzling at James’.